What size perch will the Cat Perch Cover fit? 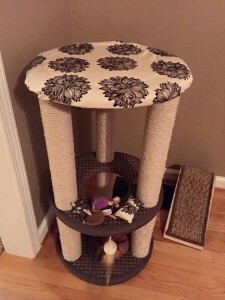 The Cat Perch Cover will fit any perch that is 10 to 14 inches in diameter, with a lip of 1 to 4 inches tall. Is this the only size and color for the Cat Perch Cover? At this time, we only have the round and square Cat Perch Covers, which fit on all perches 10-14 inches in diameter. In the future, we will be making Cat Perch Covers that will attach around a post and expanding our range of colors and fabrics. We recognize our customers have great ideas, so send us your ideas and comments for future products. Do you take custom orders for size and fabric? Not at this time, but we may do so in the future. 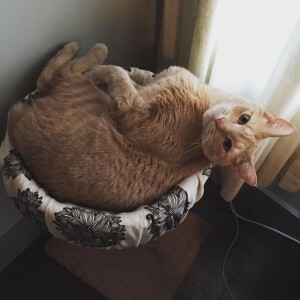 How do I wash the Cat Perch Cover? We recommend washing your Cat Perch Cover in cold water using an eco-friendly detergent or soap nuts. 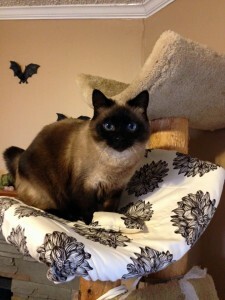 We suggest hanging the Cat Perch Cover to dry; you can also use a regular dryer on low. When I first put the Cat Perch Cover on, it’s a little loose. Will that change? Yes, all fabrics will shrink some. They range from .1% to 10% max shrinkage, depending on how you wash and dry them. 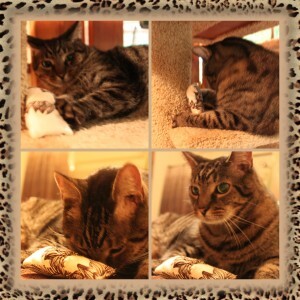 After the first few washings, your Cat Perch Cover will have an even better fit. Will my Cat Perch Cover fabric fade? All printed/dyed fabrics will fade (organic or conventional)…the darker the fabric, the more noticeable this will be. It helps to wash your Cat Perch Cover in cold water and either hang to dry or dry in dryer on low heat. We will be doing a short blog on this topic in the near future, but here are just a few reasons why organic cotton is better than conventional: the organic process showed reduced global warming potential, lower soil erosion, less water use and less energy demand. Also, here is a great comparison chart on organic vs. conventional cotton. My Cat Tree/Tower/Scratching Post is all torn up. How can I make it look like new again? 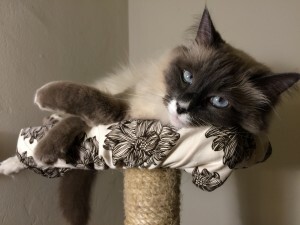 This is an awesome question and we have a blog post with video showing exactly how easy it is to revitalize your cat tree. Shipping is Free for All Orders in the US, including Alaska and Hawaii! International packages will ship by either USPS First Class International or USPS Priority Mail International, based on the weight of the entire order and shipping method with the least expensive rate. We do our best to ship within 24 to 48 hours of receiving the order. Our offices are closed on weekends, and any orders placed after 5:00 PM ET Thursday will ship the following week. Orders placed over state and Federal holidays will be shipped following standard U.S. Post Office holiday shipping guidelines. We ship within the U.S. by trackable USPS Priority Mail. International packages will ship by either USPS First Class International or USPS Priority Mail International, based on the weight of the entire order and shipping method with the least expensive rate. Please remember to include your email address so we can contact you if there are any questions or problems with your order. Shipping can take anywhere from 3 to 10 days, although the normal delivery time is 3 to 5 days. When your order is processed and shipped, a USPS tracking number will be emailed to you at the email address which you have provided to us. You will be able to use this number to track the status of your shipment at any time by going to www.usps.com and entering the number in the appropriate location. 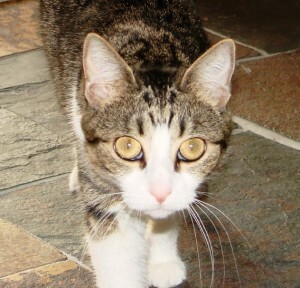 At Climb-It Cat our goal is to ensure that every customer (feline and human) is a happy and satisfied customer! Returns are accepted up to 30 days from original order date. “Sale” items are not eligible for returns – all sales are final on any “sale” items. Please check your order immediately upon receipt. If your order arrives damaged, please contact us immediately and we will replace the damaged goods in a timely manner. If you prefer to be refunded, then after the goods have been returned by you and received by us, a credit will be promptly applied to your account. What if I ordered an item that went out of stock before my order was shipped? We do not ship incomplete orders without contacting you. If an item on your order goes out of stock between the time the order is placed and when it is processed for shipping, we will contact you and give you information about back-ordering the item. We accept all major credit and debit cards – Visa, Mastercard, American Express, and Discover. We do not accept personal checks, bank checks or money orders at this time. Please note that we are unable to modify orders once they have been submitted. If you need to add items to your order, please place a separate order for any item not in your original order. If you need to cancel the order or change quantities, please contact us via email at meow@climbitcat.com. We respect the privacy of visitors to our website, and our pages and applications on third-party social networking sites such as Facebook, Instagram, Twitter, Pinterest, and our Newsletter. What information does Climb-It Cat collect? When making a purchase through our Site, we collect your name, billing address, phone number, e-mail address, and credit card information, in order to process your order. Therefore when you visit our Site to place subsequent orders we can save you time by providing your previous account information for you. How does Climb-It Cat use the data it collects? We use the data collected from you primarily to process and fulfill your orders, to notify you of the status of your orders, to send our e-mail newsletter, or to send you targeted marketing information, such as special product offers, or other information that we believe might interest you. In every such e-mail, we will have instructions on how to unsubscribe and avoid receiving any future e-mails from us. With whom does Climb-It Cat share information? Climb-It Cat does not share any of your personal information with any 3rd parties.